See the Real Europe -- the Safe, Easy, Affordable Way! Go Where You Want - Save Time & Money on Hotels - Take the Kids! Just get in a van and go! It's guaranteed to save you 10 times its cost. Explore at your own pace in clean, civilized comfort. 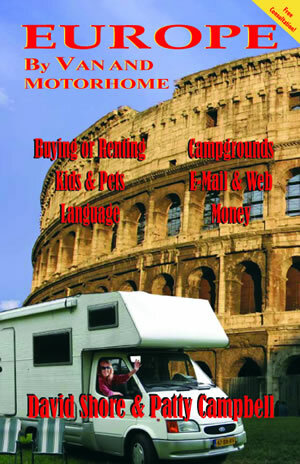 Renting and buying campers and motorhomes in Britain and Europe. Taking the Kids and keeping them happy. Campgrounds, language, money, shopping, cooking, etc..
Cyber Cafes and Wi-Fi to keep in touch . Whom to call and how to do it. Saving money, time, and trouble. "Camping in Europe is safe, reasonably-priced, and a great way to vagabond with the locals. For more information get a copy of the newly-revised Europe by Van and Motorhome." "All you need to know and then some"
"Here's a book that can save you money and speed you on your way, too.."
"Guides you through the entire process." "Explains how to get more for your dollar. Should inspire one to try an on-the-road vacation on the Continent." "The most extensive guidebook on European camper travel that you're likely to find." Europe by Van and Motorhome will save you time, trouble and money on your European vacation. It's a fun-to-read guide with everything you need to know about renting, buying, driving and enjoying vans and motorhomes in Britain and Europe, with photos, cutaway drawings and vehicle descriptions. A home on wheels saves on the major expenseshotels and restaurants as well as the daily hassle of finding rooms, packing and unpacking, and dragging luggage around. Once you move in, you have transport and accommodations for the entire trip (with private bath). You can eat out or save by experimenting with European groceries in your own little kitchen. Europe by Van and Motorhome tells you whom to call and how to do it, taking you through the whole process of selecting a vehicle to rent, or evaluating and buying a used one. The best booking and sales agencies in Europe, the UK, Australia, Canada and the US are listed, with addresses, phone and fax numbers, and e-mail addresses so you can save by dealing direct. Complete information on trip planning, including documentation and insurance, roads and driving, finding the best campsites, traveling with children, language, money, food shopping and cooking, and more is offered. David Shore and Patty Campbell honeymooned on their first van trip to Europe in 1981, and have been enjoying and recommending this mode of travel ever since. They have written several books on exotic vanning, including Europe Free! The Car, Van & RV Travel Guide, New Zealand by Motorhome, and Patty's On-The-Road Gourmet. David and Patty have been frequent guests on radio and television talk shows to explain why motorhoming is the most comfortable and economical, as well as the safest, way to visit foreign places. Campbell is a literary critic, editor, and columnist. She is the author of seven books, among which her favorite is Passing the Hat: Street Performers in America. Shore is a journalist and magazine/public relations specialist whose writing and photography have been published internationally. Refund Policy: 100% on books if not satisfied. Simply return the books. Refunds on reservations are made in accordance with providers' policies. Road Trip Europe charges no fees.